If you love the cool look of leather but long for the warm feel of fabric—you’ll find the Bladen full sofa sleeper fits the bill beautifully. Rest assured, the textural, multi-tonal upholstery is rich with character and interest—while plush, pillowy cushions merge comfort and support with a high-style design. 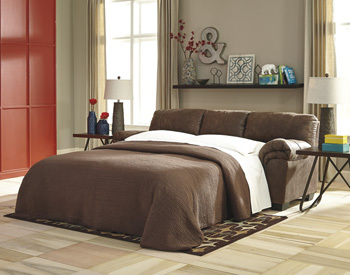 A pull-out full-size mattress accommodates overnight guests.